Along with all conveniences of our hotel, our region offers a wide range of sights and attractions. But also sports, leisure and shopping facilities. On the following list we would like to give you some highlights. 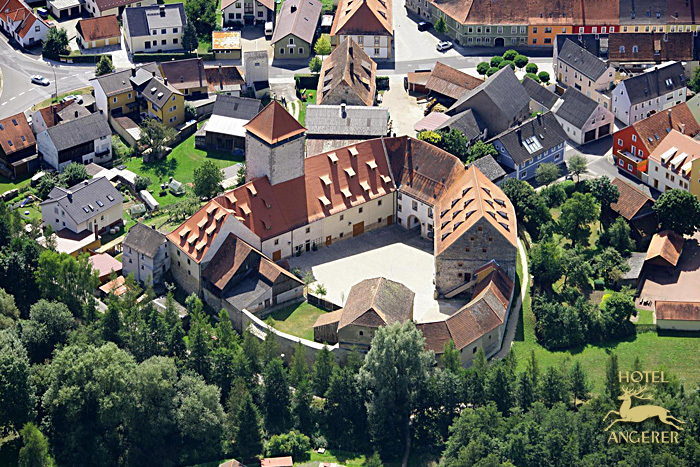 The Dagestein castle is the oldest among the historic monuments of Vilseck. Some of the older sections of the castle date back to around the 12th century. The castle`s tower, which is about 75 feet high, offers an excellent view of the old town and the surrounding area. 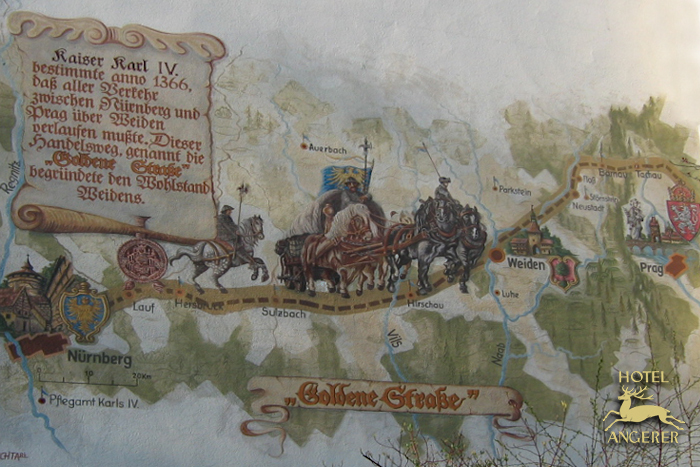 The influencial emperor Karl IV (1316 – 1378) wanted to create a connection through Bohemia from Nuremberg to Prague. 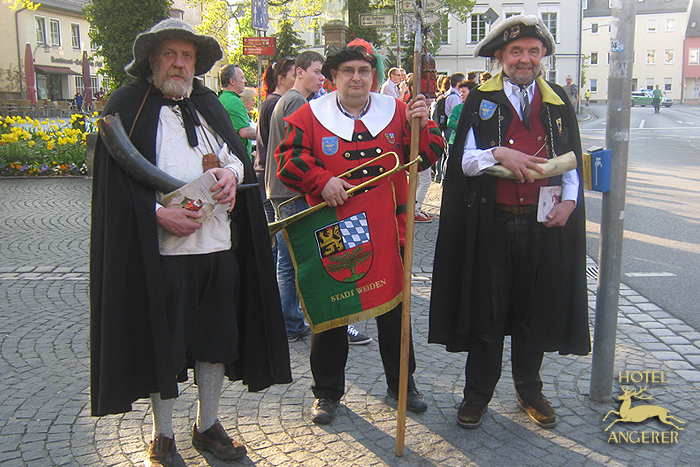 On this basis a street was created which leads along certain places: Nuremberg – Erlenstegen – Rückersdorf – Lauf – Hersbruch – Sulzbach – Hirschau – Kohlberg – Etzenricht – Weiden i.d.OPf. – Altenstadt a.d.WN. – Neustadt a.d.WN. - Püchersreuth – Plößberg – Bärnau – Tachau – Mies – Pilsen – Beroun – Prague. Many of these cities offer different attractions and historical information. Around the Golden Road hiking trails and cycle tracks were established. The Vogelturm is the landmark if Vilseck. It now includes the first german museum of night watchman. Over several floors you can take a hike through their history and culture. The doors are opened on friday, saturday and sunday and on public holidays from 14.00 p.m. - 17.00 p.m. or after prior arrangement by phone. First mention of "Vilseck" (= town of Vils castle) in a document in 1185 and a few years later in 1190 we know about Castle Dagestein. Commencement of building a new castle complex. At the same time the town develops - castle and town consolidate. The Castle Tower now turned into a viewing tower. Building of the Vogelturm ("Vogel Tower") in the year 1466, which is the 4th town gate (the town´s landmark). In 1908 the military training area Grafenwoehr North was founded. 1937/38 the South Camp of the military training area Grafenwoehr was constructed. In 1945 the United States take over the South Camp. In the landscape of the Bavarian Forest you will find the Monte Kaolino. It is an unique dune scenery out of 32 Mio. tons of quartz sand. Enjoy a chilling at the nearby dune open-air bath or a panoramic view on the peak of the Monte Kaolino. In the wood high rope course you can climb up to a height of 12 meter on adventure paths. Trained personnel stands apart. 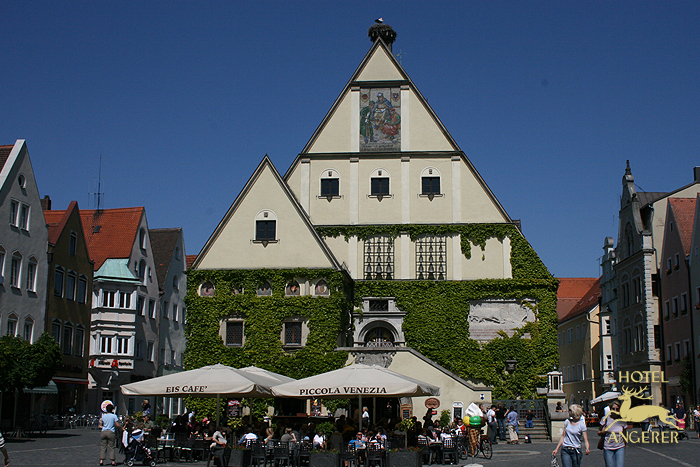 The historical, administratively independent city of Amberg is one of the best preserved medieval cityscapes of Europe. 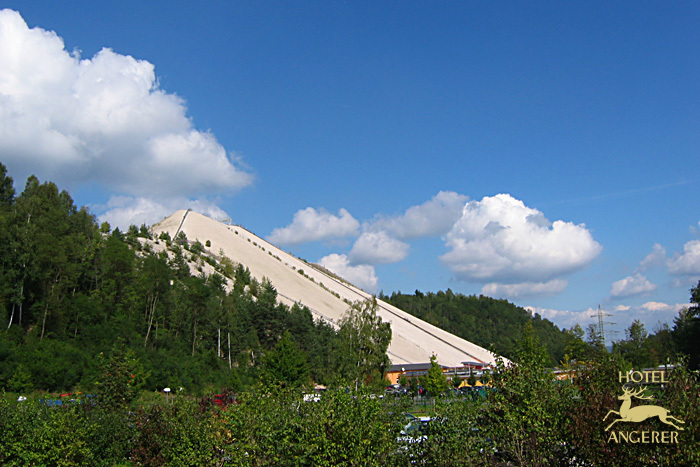 It is located about 60 kilometers east of Nuremberg. 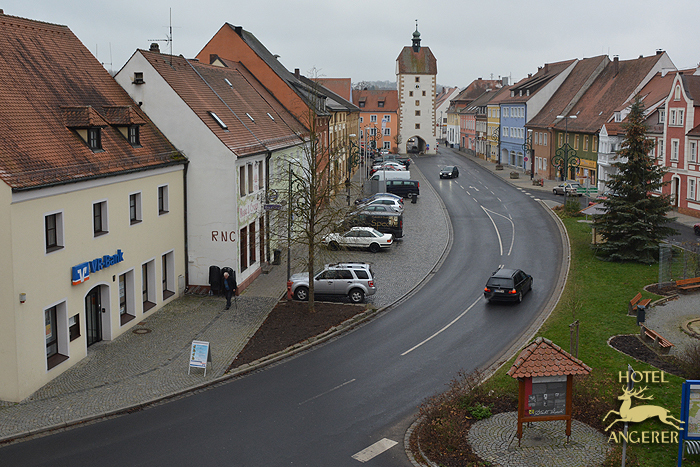 The district town of the district Amberg-Sulzbach belongs to the alliance “bavarian iron road”, which connects from Pegnitz to Regensburg historical industial and cultural monuments. “Diving out of the everyday life into wellness and fitness. This is the guiding principal with which you can take a break for an relaxing day. 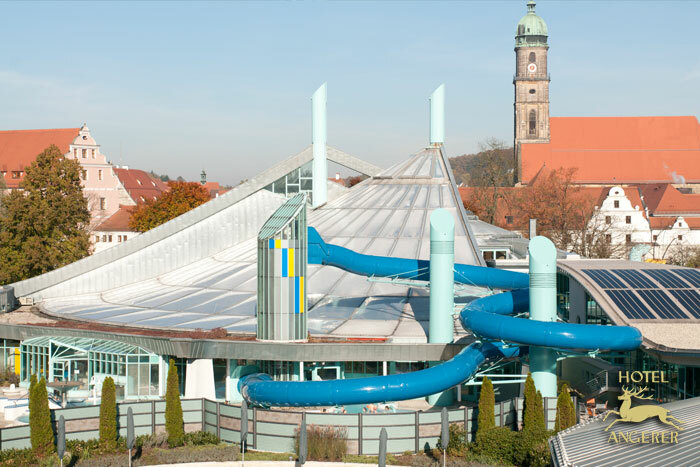 Trained operators take care of a systematically application of the water-fitness-equipment. You can enjoy the sauna area or relax into the non-swimmer pool in warm temperatures. For swimmers the separated sport sector offers cooler temperatures. Weiden is the center of the northern Upper Palatinate. Since it appeared first in a document in the year 1241 the city is looking back on a continuous development of trade and industry. It is located at the historical trading routes “Goldene Straße” and “Magdeburger Straße”. Global player of the porcelain industry and of the textile retail carry the cities name all over the world. The name of the composer Max Reger, who grew up in Weiden, is closely linked with the city. He was made famous for his organ songs. 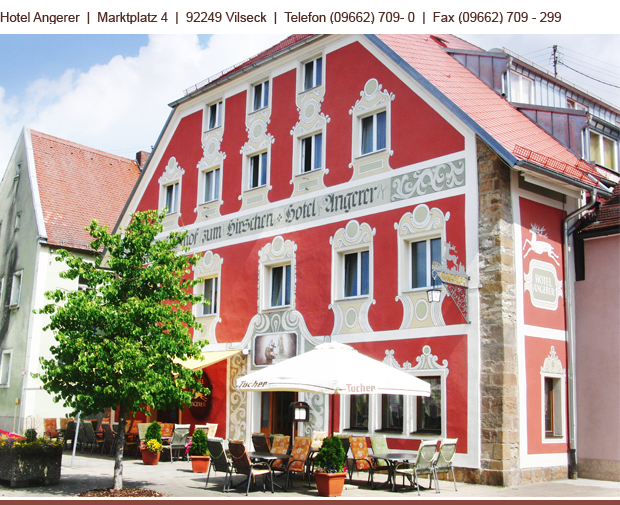 Worth seeing is the historical center of Weiden with its many shops and cafes. Listen to the carillon at the old townhall or visit the evangelican church St. Michael, the catholic church St. Josef built in Jugendstil or take part at a guided tour through the city. It is one of the most popular hiking tours and excursion destinations in the northern Upper Palatinate. Once the Castle Parkstein stood atop. The village Parkstein with the same name ist grouped around the volcanic created mountain. The Parkstein is the eroded vent of a former volcano. In exemplary form today you can see the basalt columns which were made by cooling. This 38 meters high basalt formation is created of five pentagonal and hexagonal columns which can be up to one meter high. Individually columns extending 30 meters into the ground. The precise exploration of the earth´s crust was the aim of the continental deep drilling programm. It comprised a lot of scientific individual projects. For this reason specifically technology for drilling and monitoring had to be developed and tested. The “KTB” was the first german major project of geoscientific basic research. 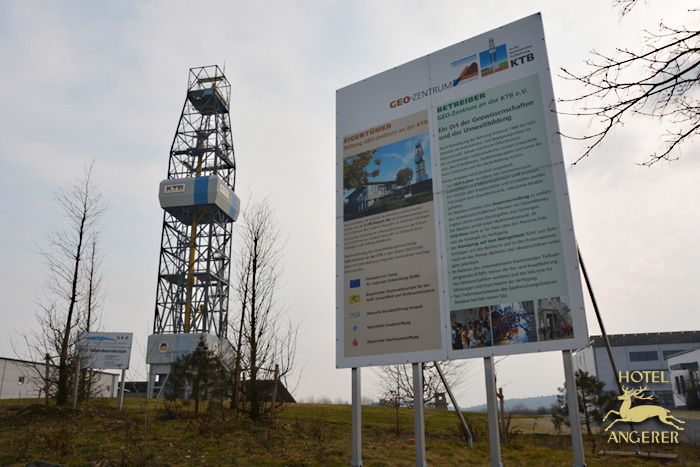 The rig in Windischeschenbach can be visited. The City Windischeschenbach is located in the Upper Palatinate Forest and is also called the “Gate to the Waldnaabtal”. It´s a recreational area for hiking and cycling. 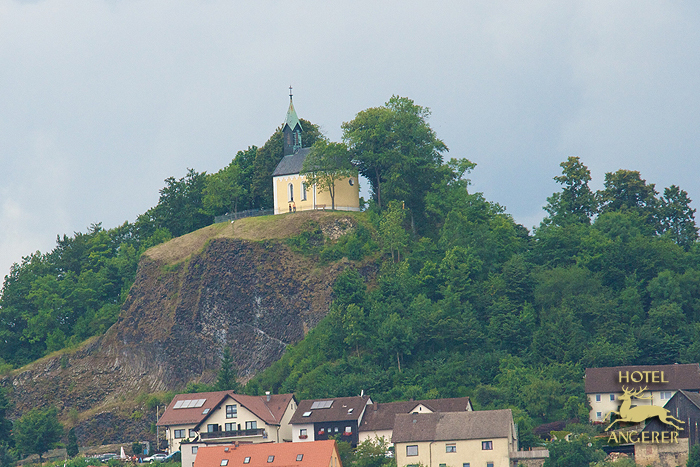 You will find the museum of the Waldnaabtal in the castle Neuhaus. It is a regional archive of culture and the way of living. In about 70 meters below ground the Maximiliams grotto enchants every visitor. 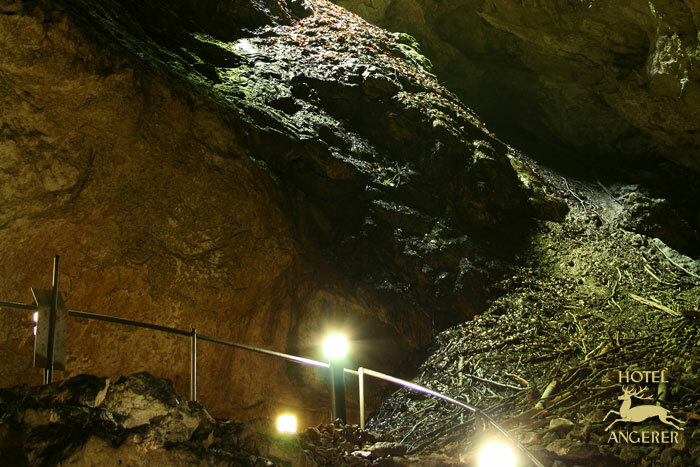 There is so much to see in the limestone world during the guided tour through a part of the 1200 meters long grotto. After few meters you go deep inside the moutain when your eyes have adjusted to the dimness. Maybe you can discover the contour of an elephant, of a baptismal font, of the Mother of God or the ones of many other freaks of millenniums.